I dread October. I change the TV channel when all the pink ribbon commercials come on. I understand why my wife hated pink ribbons. There was nothing pretty or delicate about the disease that ravaged and killed her at age 47. My wife was Dr. Suzanne Hebert Imondi. She was your vice president. She was my true love. 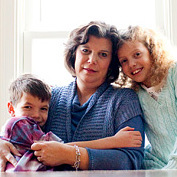 Ye ars ago, Suzanne asked me to share my experience as a “cancer husband” to help MBCN members. I never did. Now, I write this as a heartbroken widower who is trying to raise two young kids without their beloved mom. I thought I was a good Cancer Husband. I spent countless hours in waiting rooms in cancer centers from Boston to Houston. I slept sitting up for weeks in uncomfortable hospital visitor chairs by Suzanne’s bedside. I kept a large binder with me with copies of PET scans, path reports and lab values. I used a label maker to make sub-divisions and taped physicians cards to the inside cover. In retrospect, I think I was trying to control a disease that could not be controlled. If I could offer some meager advice to all of those battling metastatic breast cancer and their loved ones, it would be to try to hold on to those moments of happiness when they come. Suzanne and I lived from scan to scan. We would go over the PET scan results and anxiously highlight the areas that were too many times described as “lesions that could represent further metastasis.” Don’t wait for “clean scans.” They may never come. Go to Disney or rent a villa in Italy before the next scan. Lean hard into joy. Sometimes we forget to live while we’re trying not to die. Please write lots of notes and record videos for your loved ones. Suzanne did not like the finality that those things implied. But now I see how our brave, beautiful kids cherish every note she ever wrote to them. It helps keep them constantly connected to her. Lastly (and most difficult for me to discuss) remember to say everything you need to say to the people you love. Even though Suzanne lived over 7 years from her initial metastatic breast cancer diagnosis, I thought we had more time. The end happened more quickly than I expected. I thought I had had more time to remind her that even with no hair and draped in hospital green, she was the most beautiful girl I had ever seen. I thought I had more time to tell her how she was the best thing to ever happen to me. I thought I had more time to just hold her and tell her how much I loved her. I am sorry I don’t have more to offer all of you brave women fighting this disease. Please do know that your courage inspires many. Know that your Cancer Husbands, like me, would give their lives to lift your pain even for a minute. Most of all, know that you will never, ever be forgotten….. This entry was posted on Thursday, October 10th, 2013 at 8:23 pm and is filed under caregivers. You can follow any responses to this entry through the RSS 2.0 feed. You can leave a response, or trackback from your own site. Thanks David, The pink penalty flags in the NFL capped it for me. Thank you for being there for your wife. Many of us are now divorced and face this beast without a help mate. Many men do not have the love and courage to support wives with stage IV breast cancer. Hi Colette- my husband and i have definitely gotten very close to that point and i was an early stage BC survivor. If it was stage IV, who knows. In all honestly, I think its far more common that husbands leave than stay next to their cancer diagnosed wife. I’m sorry for your struggles and hope you find strength in those that love you. What a beautiful and moving tribute to your wife and her memory. It is clear that you were an outstanding ‘cancer husband’! As the co-director of UNC’s Single Fathers Due to Cancer program (http://singlefathersduetocancer.org), I can also appreciate the challenges you are now facing: your own grief, shepherding your children through their grief, and figuring out how to be an “only” parent. Please visit our website; I hope you find it to be a valuable resource. My best to you and your children. Thanks for your kind words and the book advice, Justin. Also, I wanted to pass along word of a tremendous book written by one of fathers in our support group. The father’s name is Bruce Ham is now the widowed father of three daughters. His book is titled: “Laughter, Tears and Braids” and is available on Amazon. I’m biased because I like and admire Bruce – but the book is simply amazing. He captures what its like to be a ‘cancer husband’ like nothing else I’ve ever read. I can’t recommend it highly enough. Hi David, I’m a widower too. My late wife Jen passed at the age of 40 and your words ring so true. I hope each day brings a little more peace to your soul. I met Susan through MBCN and its conferences (plus another in FL). I admired her so much! Your story is one that needs to be shared. I hope I am leaving enough ‘notes’ for my boys. My boys were born in October and it is the month we celebrate our wedding anniversary, so I can’t fully dread October. But the pink is to the point of nauseating. Thanks, Lynn. She always considered you a true sister. Thanks for this Dave. Thanks for your generosity in sharing your thoughts and your characteristic sincerity. I was there the day you met and was privileged to have you both as my dear friends. You continue to be an inspiration as a friend, a father and a husband. Thanks, John. She loved you and Colleen immensely.. I was moved by David’s blog post and decided to share it with readers of the Healthcare Marketer Blog. We can definitely learn from his experience as a breast cancer widower. My thanks to David for sharing his story. Thanks for sharing David. I hope your letter will encourage other husbands to continue to support their wife through their illness. I just lost my wife to a very aggressive cancer after a year long battle. I was by her side for each scan, each radiotherapy, each chemotherapy and when she passed away. After all, her cancer battle was not only her fight but mine also because I wanted to continue our lives together. Completely said, David. Thank you. My wife’s metastatic journey lasted the near average 3 1/2 years. As you noted, death came very quickly, much faster than I ever would have thought. My wife and I didnt say everything that might have been said between us, but we did say enough – enough for me to remember and draw upon in moving forward and starting a new chapter in my life. Every year since my wife’s death, I wear a bright pink sweater on or about October 13th. I tell others why I’m doing this and I urge women around me to get their checkups. No one jokes about the sweater. This year one woman even complimented me by saying I wear the pink sweater because I’m strong enough to do it.